I built this one hand analog clock simply by putting a hand on a stepper motor, then using a LiniStepper v2 and my own firmware to make the stepper motor turn exactly one revolution every 6 hours. Because the LiniStepper PCB gives linear smoothed microsteps the clock hand moves very smoothly (and slowly!). The clock is synced to mains frequency and keeps perfect time. 12 o'clock and 6 o'clock are both at the TOP of the dial. 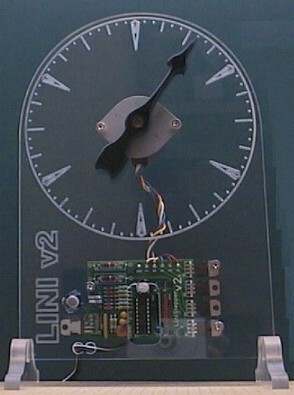 The clock body and hand are CNC cut from acrylic plastic and the stepper motor was a junk one pulled from an old bubblejet printer. 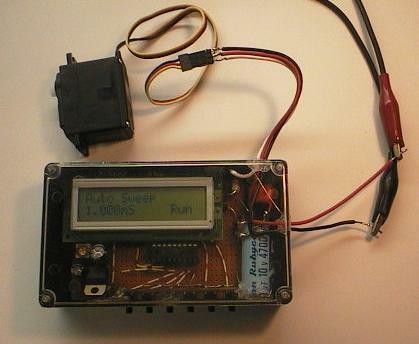 This complete project has its own page and includes free open-source PIC asm firmware for PIC 16F628A. 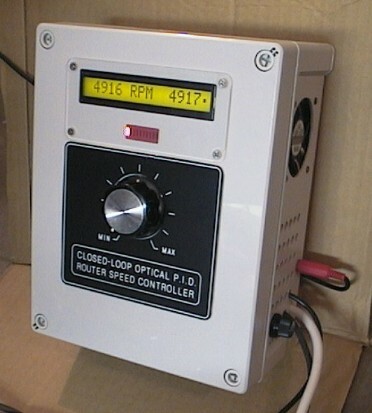 This is a speed controller to use on my CNC machine, it is closed loop and uses a optical RPM sensor on the router spindle shaft and my own specialised PID math system to control the router RPM. 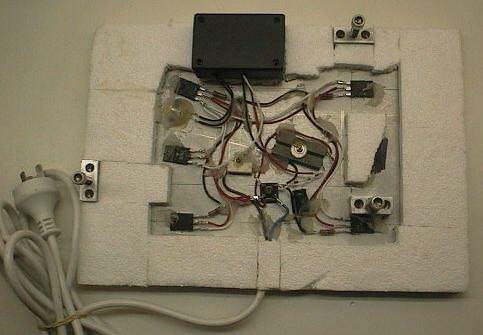 Hardware consists of a large IGBT for mains power switching, a lot of filtering and mains components, fan etc, and a PIC micro as the brain. I used a Shift1_Tacho PCB and a large format 16 char LCD display to provide a nice accurate tacho. It also has a 10 LED bargraph display that shows the percentge power being fed to the router motor. I was building a friend a huge 12v battery charger for his solar installation and needed a dummy load to test the output. Big Dummy is a 500W dummy load for testing high power 12v to 48v supplies at up to 30 amps. It is not pretty, because it was built in a hurry from a couple of old surplus 1960's heatsinks that already had 8 big TO3 and darlington drivers on each sink. 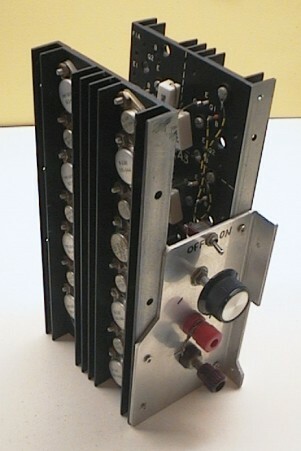 This setup was typical of big linear power supplies of the time. These are good quality sinks and had nice teflon high temp wire etc on them, I pulled the sinks off some Vietnam era military power supplies in a junkyard about 15 years ago and it was about time I put them to use. For 45 year old equipment all the parts are still in perfect condition and fully working. I bolted both sinks vertically to a 3mm aluminium plate and added a new pot and knob for the current adjustment and a switch to turn the biasing on/off so I don't have to pull a plug with 30 amps going through it. In total there are 15 TO-3 transistors and 15 smaller driver transitors as a massive parallel darlington with a third driver trasistor (trilington) and the pot. There are 15 1ohm 5W emitter resistors to stabilise the current. I use a desk fan to cool it when sinking currents above 20 amps. This was a fun project. It is a very simple lantern, you turn the handle and the white LED lights up, and it also charges a 1 farad supercap which lights the LED for a few of minutes after cranking. The lantern is very pleasant to use, unlike noisy cheaply made commercial human powered torches. It has 2 sitting positions, one lights the table, the other is tilted up 45' and lights an area of the wall. I designed and built this after many power blackouts and each time finding the torches all had flat batteries... That has never been a problem with this beauty. I used a 1980's power amp (P.A. amplifier) case which had a great heatsink front panel and huge beefy power supply. I installed 2 "Gainclone" style high performance audio amps and built a regulated low noise power supply. This project now has its own page. Early 2007, web Feb 2008. This gadget drives any RC Servo and allows the servo to be tested, positioned or exercised (run in). Sometimes I work with RC Servos for robotics and this unit has been very handy! Made from junk box parts, the only new part I think was the neat plastic zippy box with clear lid! Uses PIC 16F628 and a 16x2 line LCD. The 6 button assembly was from an old TV set I think. DC power is from my bench supply so I can use its volt and amp meters when testing the servos. The unit has its own +5v regulator built in for the PIC and LCD. Everything was thrown together with hot-melt glue as I was in a hurry! It has a few modes, manual and auto sweep modes. In auto sweep the unit sweeps the servo full scale every second, ie from 1.0 mS to 2.0 mS pulse width. This is handy for running in mechanisms and heat testing etc. In the manual modes the servo can be moved in very small amounts or larger amounts depending which button is pressed. The unit has accurate timing (driven from 8MHz xtal), and at all times it displays the servo pulse width in actual milliseconds and microseconds. Smallest adjustment is 5 microseconds. This allows the servo to be positioned to an exact angle, then the mS value (ie 1.245 mS) read from the display and that can be used later in robotics software for that same servo etc. It also lets me test servos and rotate them well past the "proper" limits to find their exact travel-limits. Yes I know that some of the Servo companies sell similar servo testers to this, but they are quite pricy! This one was built for a few bucks to suit my exact needs, and I can reprogram the PIC at any time to add new modes and features. Mar 2007, web Feb 2008. 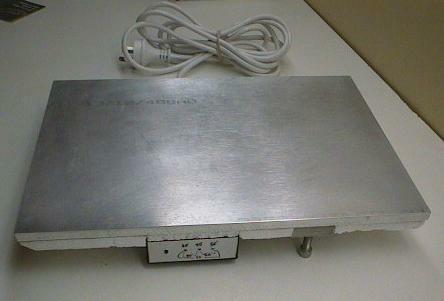 This is an electric hotplate, about 400 x 300 mm size. It is made from 12mm (1/2") thick aluminium plate which has been surface-ground to a very flat surface. It can be "levelled" by adjustment of 2 of the 3 feet, which are stainless bolts and can simply be rotated to adjust the height. I positioned the feet in a right-angle triangle so one bolt changes "roll" and one changes "pitch". 35'C, 40'C, 45'C, 50'C, 55'C, 60'C. These temperature settings are very useful for hardening and curing molds and epoxies etc, equally useful is the precision flat-ground levelled surface. Clever stuff; To get the thing to maintain a very exact temperature even with its large thermal mass, I developed a "forced time-constant" closed-loop temperature control algorithm. The PIC micro using this algorithm keeps the hotplate within 0.2'C of the desired temperature which is a big improvement over the large thermal ripple and laggy response caused by a normal closed-loop temp control. With the bottom cover removed you can see the transformerless design. The 240v 50Hz AC mains is rectified and the resultant 100Hz 300v DC feeds the 4 main flat pack transistors. These act as transistors (ie controllers) and they are ALSO the heating elements! They are 1500v 5A TV h-out transistors with internal protection, so they are much more rugged than required, to give long life. They are also a fully insulated package type, because the metal hotplate is grounded! All the wiring and parts are secured with screws and high-temp silicone so nothing comes loose. The PIC micro (inside the black control box) is powered via 2x 10 watt resistors into a 16v 5 watt zener diode and a big filter cap. This gives 16v DC at about 25mA, reasonably regulated. There is a +5v (low quiescent current) secondary regulator inside the box that gives a very stable +5v dc for the PIC, leds and temp sensor. The PIC is a little 8-pin 12F675 running 4MHz on internal RC osc. The temp sensor is a DickSmith 100k NTC Thermistor, clamped and epoxied to the hotplate next to one of the 4 big power transistors. My special algorithm allows the use of a "crude" thermistor and still gives very good temperature control. The hotplate heaters run at a forced max of 40w each (160w total). They run in constant-current mode with +4v on their base and an emitter resistor. So each heater produces the same amount of heat. I positioned the 4 so the heat is equally distributed over the entire hotplate. Another large transistor acts as a darlington common driver and gets the 4 drive currents from the mains, the pic only needs a couple of mA to operate all 4 heaters. In use the heaters are ON about 1/4 of the time at 35'C and about 2/3 of the time at 60'C, 160w was just right for good temp regulation and gives a reasonably fast warm up of 5 to 10 minutes.